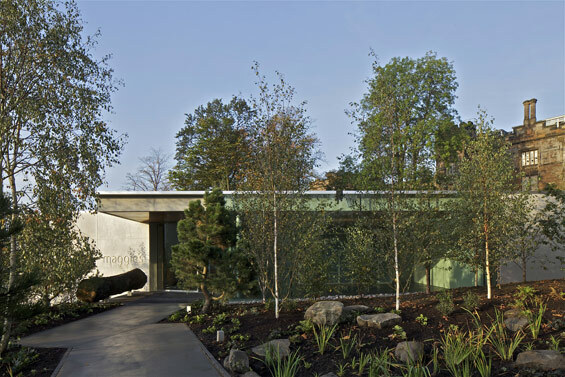 Located in a natural setting, like a pavilion in the woods, the building is both introverted and extroverted: each space has a relationship either to the internal courtyard or to the surrounding woodland and greenery, while certain moments provide views of Glasgow beyond. With a flat roof and floor levels that respond to the natural topography, the rooms vary in height, with the more intimate areas programmed for private uses such as counselling, and more open and spacious zones for communal use. 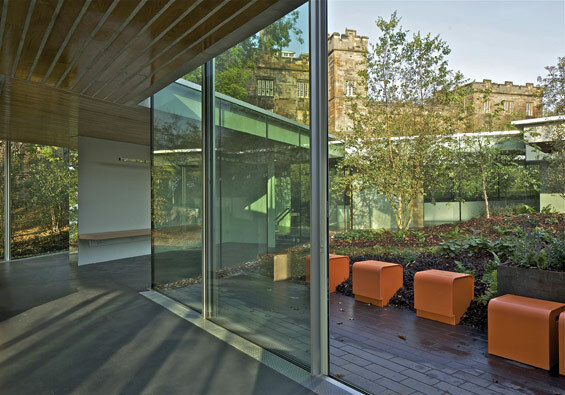 More than any other space, the internal courtyard provides a place of sanctuary and respite. The aim of a Maggie’s is to provide an environment of practical and emotional support for people with cancer, their families and friends. 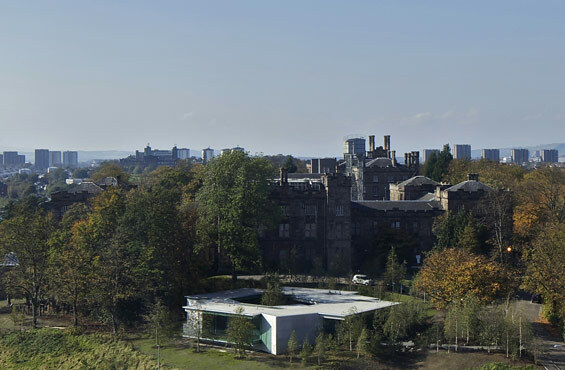 Since the opening of the first Maggie’s in Edinburgh in 1996, the Maggie’s Cancer Caring Centres foundation has grown substantially, commissioning and developing a series of innovative buildings designed by world class architects. While contemporary architecture has a reputation, deservedly or not, for being at times cold or alienating, the goal of each Maggie’s – whether in Glasgow, London, or Hong Kong – is to provide a space where people feel at home and cared for, a space that is warm, receptive, and welcoming. Maggie’s rely on the fundamental precept, often overlooked, that exceptional architecture and innovative spaces can make people feel better – thereby kindling the curiosity and imagination fundamental to feeling alive. Grand in their ambitions, but designed on a small scale, Maggie’s provide a welcome respite from typical institutional hospital architecture. Their spaces are more than merely functional; they serve as a haven for those receiving treatment. In creating a place to connect and learn from others who are going through similar experiences, Maggie’s help patients to develop their sense of confidence and resourcefulness. In 2007, Maggie’s approached OMA to design a new centre on the grounds of Gartnavel hospital in Glasgow, close to the Beatson West of Scotland Cancer Centre. OMA designed a single-level building in the form of a ring of interlocking rooms surrounding an internal landscaped courtyard. Seemingly haphazardly arranged, the building is actually a careful composition of spaces responding to the needs of a Maggie’s and providing a refuge for those coping with cancer. Instead of a series isolated rooms, the building is designed as a sequence of interconnected L-shaped figures in plan that create clearly distinguished areas – an arrangement that minimises the need for corridors and hallways and allows the rooms to flow. The plan has been organized for the spaces to feel casual, almost carefree, allowing one to feel at ease and at home, part of an empathetic community of people. At the same time the design also provides spaces for more personal moments – either in the intimate setting of the counselling rooms, or in smaller nooks and private spaces. Site: A green knoll on the grounds of Gartnavel Hospital. Program: 534 m2 comprising counseling rooms, sitting rooms, offices and a large multi-purpose space. Image courtesy of OMA; photography by Philippe Ruault.